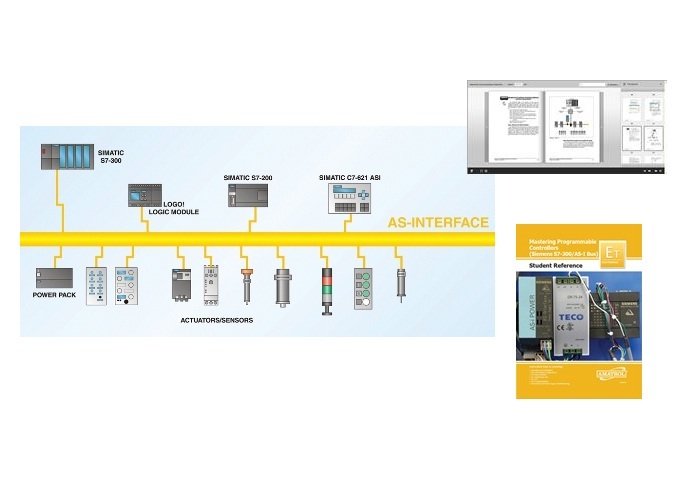 The 89-ASI-S7300 PLC ASI Bus Learning System – Siemens S7300 adds to the 890-PEC-B and 890-S7315 Troubleshooting Learning Systems to teach about AS-I slave modules, AS-I addressing units, introduction to AS-I troubleshooting, and multi-node and power supply troubleshooting. Manufacturing technicians will need to understand these networks and their operation in order to install and troubleshoot the networks as well as the network’s interconnections to PLC’s. The 89-ASI-S7300 includes: PLC ASI Bus Interface Modules; student curriculum for both theory and lab, and teacher’s assessment guide.